A real estate developer required a large Chicago area street map for a display wall in their downtown Chicago sales office. Their advertising agency contacted Randal Birkey requiring a Chicago street base map with approximately 300 specific locations to be added. 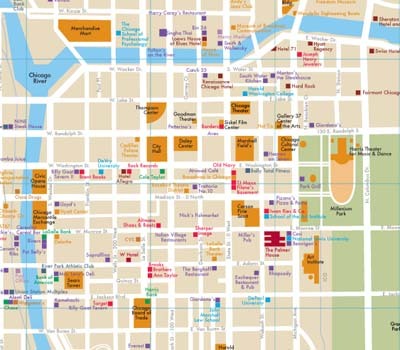 Randal Birkey modified an existing Adobe Illustrator Chicago street map, adding the 300 locations with color markers and text labels. The map file was delivered via web download, in a layered Adobe Photoshop format within a very short time frame. The file was to be output on professional digital printing equipment in long roll sections, and used as “wallpaper” in the 565 West Quincy project sales office.